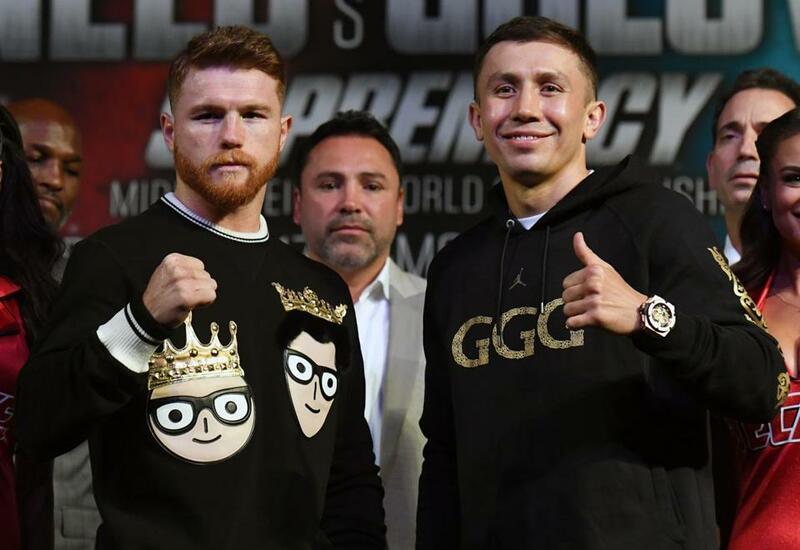 Oscar De La Hoya (center) looked on as Canelo Alvarez and Gennady Golovkin posed for pictures ahead of last year’s fight. Oscar De La Hoya can breathe a sigh of a relief. After a series of delays and intense negotiations, the long-awaited rematch between middleweight champion Gennady Golovkin (38-0-1) and Canelo Alvarez (49-1-2) finally will take place Saturday night in Las Vegas, one year after the two originally met in the ring and fought to a draw. That animosity was demonstrated this week, when the two combatants refused to pose together for the traditional faceoff in the final press conference ahead of the fight. Last year’s fight was pretty much what boxing fans were hoping for. But when it went the distance, it also delivered what boxing fans unfortunately have come to expect: controversy. You never know how it will play out when a fight goes to a decision. The moments leading up to the announcement of the judges’ scores are always tense, and last year was no different. The fight was ruled a draw, and while that was certainly debatable (it appeared that most observers gave a slight edge to Golovkin), the decision seemed reasonable. Until you looked at the judges’ scorecards. Dave Moretti scored the fight 115-113 in favor of Golovkin. Don Trella scored it even, 114-114. Then there was Adalaide Byrd, who scored it 118-110, essentially deciding that Alvarez won all but two rounds. How can two people watch the same fight and have a discrepancy of five rounds, where one judge has Golovkin winning seven rounds and another has him winning just two? “It takes away from how great the fight was,” said De La Hoya, whose Golden Boy Promotions will be running Saturday’s fight. “It had to be one of the best fights in recent years. The middleweight division should be competitive, should be exciting, and that’s exactly what they delivered. The fight was supposed to harken back to the glory days of the middleweight division in the 1980s, and it did just that, but not in the manner many had anticipated. Boxing fans were hoping it would rival Hagler-Hearns from 1985 or Hearns-Leonard from 1981, but after the scores were announced, it was more reminiscent of Hagler-Leonard in 1987. That fight also went the distance. Lou Fillippo had it 115-113 for Marvin Hagler, Moretti (yes, him) had it 115-113 for Sugar Ray Leonard. Jo Jo Guerra scored it 118-110 for Leonard. Hagler, believing he had been robbed, retired and never stepped into the ring again, despite the promise of another big payday if he accepted a rematch with Leonard. Boxing fans will not be deprived of a rematch this time around, nor will they have to worry about Byrd, who will not be one of the three judges scoring the fight. Yet there has been plenty of controversy ahead of the fight. In February, Alvarez tested positive for clenbuterol, a banned substance often used by athletes to cut body fat while retaining muscle mass. Both De La Hoya and Alvarez blamed the positive test on meat contamination, as some Mexican beef farmers have been known to add clenbuterol to cow feed. “Canelo was in Mexico City before he started training,” said De La Hoya. “This was probably about three months before the actual fight in May, and he was not dieting at all, and he was eating whatever he wanted. He had some steaks and went to steak houses. The rematch, originally schedule for May 5, had to be postponed while Alvarez served a six-month suspension. In recent years, the first Saturday in May has been huge for boxing, as well as gamblers, with some of the highest-profile bouts held just hours after the Kentucky Derby. That this fight would not be held in May was a crushing blow for the sport and its fans. Alvarez continued to get tested, and was eventually cleared after his suspension was up. It was back to the drawing board for scheduling the fight. De La Hoya is hoping there is no more controversy. It’s not just the main event that has De La Hoya enthused. He believes the undercard should be entertaining as well. Of particular interest to local boxing fans should be the fight between middleweights David Lemieux (39-4, 33 knockouts) and Gary “Spike” O’Sullivan (28-2, 20 knockouts). 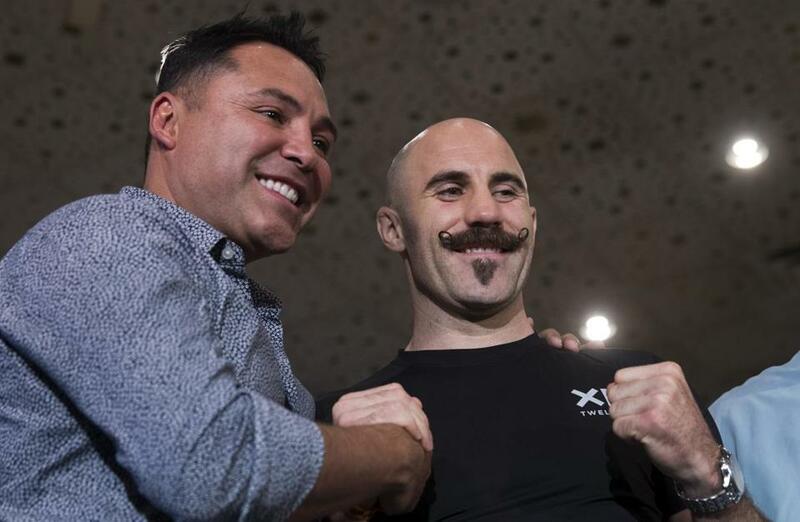 Oscar De La Hoya, left, poses with Gary O'Sullivan ahead of Saturday night’s fight. O’Sullivan hails from Ireland, but fights out of Murphys Boxing in Boston. Murphys Boxing was founded in 2014 by Ken Casey of the Dropkick Murphys. De La Hoya and Casey have worked well together in the past. “We’ve been working with Casey for quite a few years now, and it’s always a pleasure,” said De La Hoya. “We’ve done a couple of shows, co-promoted back there in Boston.